With this pylon, you won't have to construct additional pylons. Please feel free to use this mod in anything you like, just let me know so I can check it out and link it in the post! Heads up, this addon may not function correctly as I haven't touched it since 2015. Don't you hate it when you're placing down lights in your settlement and they're not getting power meaning you have to construct additional pylons? Instead of having to place 4 or 5 pylons around each house, why not just have one? This isn't starcraft, you don't need all those pylons. 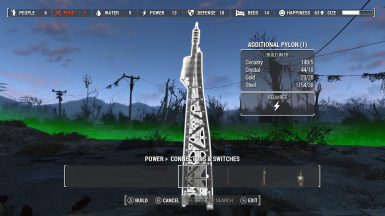 This mod adds a new item to the workshop menu, the item is named "ADDITIONAL PYLON" (because who doesn't love annoying memes) and it aesthetically identical to the large power pylon, but functionally different. The regular large power pylon has a range of 500 in game units, the "ADDITIONAL PYLON" has a range of 10,000 in game units, no that isn't a typo. It should provide power to all WIRELESS devices(Things that require "ϟ" instead of "1ϟ" e.g lights) in the settlement it is placed in. If you don't want to spend that much of your resources, I made a cheap version which uses 1 circuits, 2 crystal, 3 gold and 4 steel. This mod isn't for purists, just wanting to make that clear. If you haven't already, you need to enable modding. Once you've gone and done that, extract the zip in to your fallout 4 directory (Where fallout4.exe lives) and overwrite the data folder. After that open the fallout 4 launcher and open the hidden plugin selector by pressing on the base of the handle on the helmet. Simply tick the box related to the plugin and bobs your uncle, you'll be placing pylons like it's nobody's business. Due to the way I made this, it SHOULD be impossible for it to conflict with any other mods as I made a new object instead of editing an existing one. That being said if you run in to anything, please let me know. Thanks to NEDM for coming up with the idea, you sure do love your memes. MASSIVE thanks to skyrimlu for coming up with this guide http://www.nexusmods.com/fallout4/mods/277/? if it wasn't for that, I'd have no idea how to get mods running.